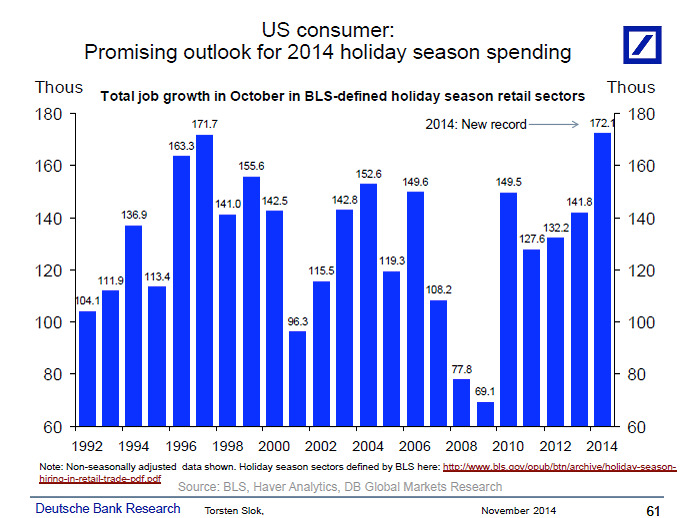 Deutsche Bank’s Torsten Slok thinks this could be the best ever holiday season for retail sales. Sloks points to recent labour market data. Because hiring for the holiday season is generally done in October, it can be a good way to predict how retailers are feeling about sales for the final quarter of the year. This particular chart, sent out in a research note this morning, comes from adding together employment growth in eight different retail sectors: furniture, electronics, personal care, clothing, sporting goods, general merchandise stores, miscellaneous store retailers (e.g., florists, office supply stores, gift shops, and pet shops), and non-store retailers (e.g., online shopping and mail-order houses, vending machine operators, and direct store establishments). 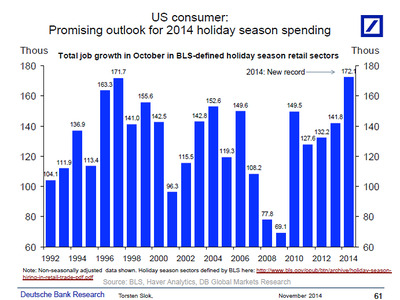 Last year, retail sales rose 2.7% over 2012 numbers.